Byron Stevenson was born on 7th September 1956 in Llanelli, Wales. He joined Leeds United as a youngster and turned pro in 1973. Byron was one of a number of youngsters who came through the ranks in the mid-to-late 70s as Don Revie's side began to break up. Much was expected of this band of players which included the likes of Carl Harris, David McNiven, Peter Hampton and Keith Parkinson. It was a daunting task to follow in the footsteps of 'Super Leeds'. Originally, Byron was seen as a replacement for the long serving Norman Hunter at centre-back. However, such was his versatility, he made his debut at right-back against Sheffield United at Brammall Lane on 1st April 1975. That game, a 1-1 draw in front of 38,442 spectators was Stevenson's only appearance that season as the defending Champions, recovering from a difficult start under Brian Clough, finished the season in ninth place. The following year, Byron was restricted to a cameo appearance at Anfield, when he came off the bench to replace Paul Reaney in a 2-0 defeat. In the 1976/77 season the young Welshman started ten games, featuring at right-back, left-back and in midfield. It was on the 15th December that season that Byron received international recognition at under-21 level, making his debut against England at Molineux, the home of Wolverhampton Wanderers, in a goalless draw. Incidentally, in the same game, Glan Letheran and Gwyn Thomas also made their debuts, all three becoming the first Leeds players to represent Wales under 21s. Stevenson won a further cap in February 1977, a 3-2 defeat at Easter Road against Scotland. The following year was a landmark season for Byron. Despite only starting three times for Leeds and making two further appearances as substitute, he won his first full international cap. It came in the Home Championships against Northern Ireland in a 1-0 win played at Wrexham's Racecourse Ground. He also won his third and final cap at under 21 level in a 1-0 over the Scots at Chester. Despite not featuring in the opening game of the 1978/79 season, Byron started the next nine fixtures, wearing the number two shirt. His first real run in the side. Ironically, he scored his first goal in the final game of that run in the team, a 3-1 home defeat to West Bromwich Albion. He went on to start 14 league games that season. He also made his debut in the domestic cup competitions. In addition, he won a further six caps for his country. Leeds United appeared to be making strides under Jimmy Adamson, a fifth place finish the previous campaign saw European football return to Elland Road. Byron featured in two of the four UEFA Cup games but Leeds bowed out in disappointing fashion to Universitatea Craiova from Romania. In the league he started 25 games, and he scored his second Leeds goal in a 1-1 draw with Arsenal in the League Cup. The goal came from the penalty spot. It ensured Leeds made the trip to Highbury for the second leg on an equal footing. It counted for very little as the Londoners ran riot, winning the game 7-0. It was in the 1979/80 season that Byron hit the headlines. On the 21st of November he was part of a Wales side that travelled to Turkey for a European Championship qualifier in Izmir. Byron was involved in an incident which left Buyak Mustafa with a broken cheekbone. He received a red card and was banned by UEFA for four and a half years. This was later reduced on appeal and Stevenson won a further two caps. The last of his 15 caps came in September 1981, a 2-0 defeat against Czechoslovakia in Prague. Jimmy Adamson was under pressure to deliver as the 1980/81 season got underway. Byron started the opener, against Aston Villa, at left-back. He could not have got off to a better start when, in the second minute, he converted a penalty to put Leeds 1-0 up. Unfortunately, Villa went on to win the game 2-1. Stevenson made 18 appearances that season, including one from the bench and he scored again in a 3-0 home win over Coventry City in April. The 1981/82 season would end in relegation. Allan Clarke was in charge and after starting 21 games (18 in the league), Byron left Elland Road. Clarke and Leeds were desperate for fire-power and Sniffer turned to Birmingham City's Frank Worthington. Byron would move in the opposite direction in a straight swop deal. His final game for Leeds United was a 2-0 home defeat to Liverpool. He would later play for Bristol Rovers and was involved with Garforth Town. Byron also ran the Angel Hotel in Rothwell, the Golden Lion in Pudsey, the Two Pointers in Woodlesford and the New Inn at Churwell before returning to Llanelli in 1996 for family reasons. Tragically, Byron passed away on the 6th of September 2007, just one day short of his 51st birthday. A victim of throat cancer. Many tributes were left on internet forums. The words people typed proved that Byron was a popular player at Elland Road. Fans acknowledged that he always had time for a chat and to sign autographs. He never 'bottled' a challenge and always gave a hundred per cent effort for the cause. Ex-players spoke highly in his memory. Described by Eddie Gray as being an elegant player who was top class. Peter Lorimer remembered a polite young man who displayed a great attitude. 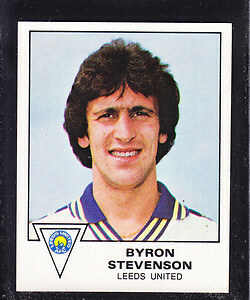 Byron Stevenson was recently at the forefront of some Leeds fans memories. In a poll to determine the one hundred greatest players to play for the club. He didn't make it into the 100 but was voted into position 165 out of 206 players that received votes.